Hi. 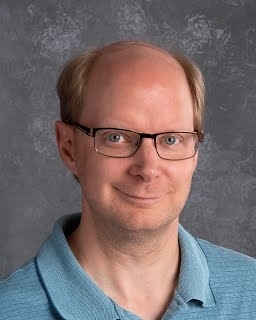 My name is Randy Muske and I am the high school math teacher. I completed my undergraduate work at St. Cloud State University in 1996 with a degree in Mathematics. In 2004, I completed my masters degree in Mathematics at the University of New Hampshire. I have been teaching for 17 years, and this is my sixth in Truman. I have taught in several high schools all around the state of Minnesota and I have taught two semesters at the college level. Because of my advanced degree in Mathematics, I was able to bring the SMSU College Now Program to Truman my first year in the district. This has allowed Truman students to get a head start on college by earning credits while still in high school. In my free time I enjoy playing board games, video gaming, hiking, traveling, and binge watching tv and films.